The Asics Gel-Phoenix 6 ladies’ running shoes are designed to help overpronators whose feet roll inwards control this for more comfortable and efficient running. The DuoMax® support system provides the support for arches that overpronators need, helping to stabilise and control strides. The SpEVA and SpEVA 45 midsole ensure great cushioning and extra support for feet which, when combined with the impact-absorbing forefoot and rearfoot GEL® cushioning, makes for smoother transitions and running. 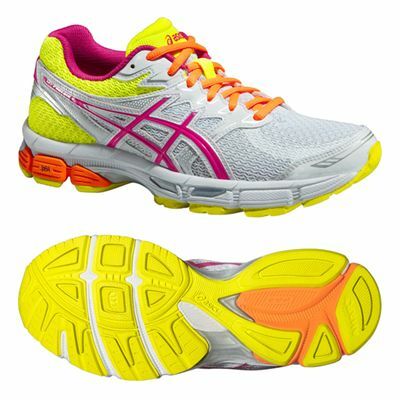 The outsole boasts Asics’ Trusstic System and uses durable AHAR+ material to increase cushioning and ride fluidity. The sock-liner is removable and 3M Reflective material in the upper helps keep you more visible in darker conditions. for submitting product review about Asics Gel-Phoenix 6 Ladies Running Shoes.